Forty-four percent of marine dealers point to tariffs and trade as their largest legislative priorities for 2019, according to a new survey, beating out issues including E15 — notably the highest priority among manufacturers, a separate survey shows. Dealers responding to the Pulse Report, administered by Baird Research in conjunction with the Marine Retailers Association of the Americas and Soundings Trade Only, rate tariffs above workforce development, invasive aquatic species, E15, fishing access and infrastructure. Another references “two to three price increases in a year, out-pricing the consumer.” Several manufacturers reported off-cycle price increases to help absorb higher costs due to the tariffs. The second-most important issue that dealers think Congress should address this year is workforce development. Twenty-seven percent said it is their top priority for the year. “Staffing is always a challenge; the cost of every employee is getting out of control,” writes one respondent. Trailing those issues are E15 (13 percent), aquatic invasive species (9 percent), fishing access (5 percent) and infrastructure (2 percent). Dealer sentiment about market conditions rose to 67 in February. While much higher than January, which measured 53, the rating is still historically low. In February 2018, the dealer sentiment rating was 79. Dealers list extreme weather and government action or inaction as things creating headwinds, while the economy, new products, trade-in activity, OEM promotions and access to credit all positively affected February sales. “Government shutdown created uncertainty,” writes one respondent to the survey. The long-term outlook also returned to above neutral — 56 versus 44 in January — yet that number is also significantly lower than the 70 rating in February 2018. Production snags also continue to plague some dealers. 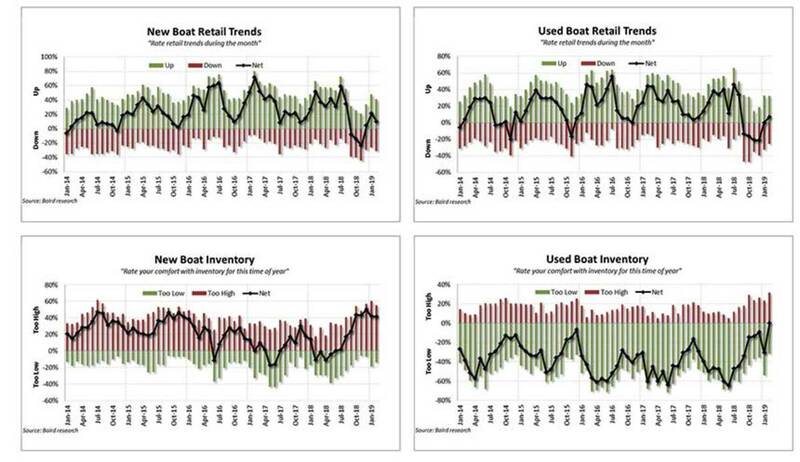 “If I’m looking to restock boats that are sold, we are already looking at 2020 model year and this is February,” writes one dealer.